11 Most Popular Female Bloggers of 2013! Today when the biggest competitor of man out there in industry is woman, even the online earning medium too is equally availed by the powerful ladies who know how to cash their talent. It was once perceived that women lack in technical skills and it was somehow true too when the technical work was all limited to the real world, thanks to the online earning strategies, now the chances to make money online are equally available for both-man and woman. 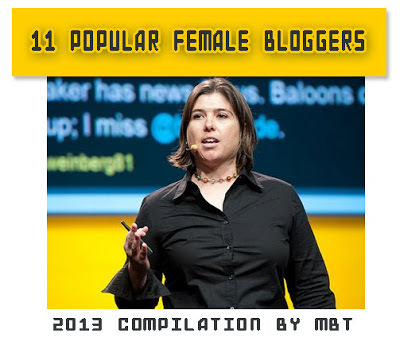 When it comes to blogging, women are a sound contestant of the race and are generating good revenue with their blogs. Being a female blogger myself, here are a few inspirational women who are known for their work. All data is latest for 2013 especially. Have a look! The lady who has made it to the top 10 richest bloggers of the world is the owner of Life hacker. The site has always been an inspiration for me where the main focus is given to how actually one can improve his personality. Gina is an active social blogger and the founding editor of her blog. She earns about $110,000 a month with her blogging skills. Rita started her blog in 1994 as a not-for-profit blog with an aim of improving the practice of management and its impact in the changing world. Although initially the blog focused on Hardvard University only, now the blog has turned into an organization where there are 30 employees, having offices in New York City, India and UK. When it comes to mixing some ingredients and making the best out of it, the Pioneer woman has no comparisons. Whether you are a housewife or a business woman, your interest in cooking is something most evident. Ree Drummond provides all what you might be looking for in food on her blog which is widely followed across the globe. Heather & Jessica have been keeping an eagle’s eye on every move taken in the fashion industry to share it all with their readers. A good site to follow. If you are looking for some great fun to laugh on, you must visit Jenny’s blog. The blog contains every aspect of life, giving it a new touch, making it hilarious. The site has a relatively good traffic rank in the cities of Hartford and Washington (DC). If you are looking for a platform to learn more about interior designing and wish to give your home a new look; then this site will provide you some decent ideas to follow. Offbeat Bride is most popular website for brides who dare to walk off the beaten aisle. The site is all about fashion, advice, photos, and more for couples who think differently about their weddings. The site is viewed by over 170,000 unique visitors a month and has over 1.2 million page views each month. Matrina is working as an insider in an integrated marketing firm and is more than willing to share all her knowledge with her readers through her blog. She’s positive, slightly spiritual, avant, and fully facing the possibility of every day, which is probably why so many people turn to her for guidance on how they can expand their brands, their campaigns, their work, and their minds! The lady whom we know as a Community & Marketing Manager at Mashable, Tamar has been all up in social interactions for 15 years. Although her personal blog needs more than what she is contributing at mashable, it is likely to expect techpedia one of the biggest rivals of mashable in the coming months. So you see, women can make it all possible no matter which ever field you pick to compare the capabilities of a man with a woman. One thing that is common in all of these women is their consistency and high spirit.